I am going to begin this post, which is mostly an anecdote, by telling you how I ended up with my current computer, Ulysses S. Grant. You see, long before Dan and I started dating, we were friends. Good friends. The kind of friends that harbored secret crushes on each other and watched a lot of CSI together. We met in a class called Exhibition Development Seminar at the Maryland Institute College of Art. This class was the beginning of what would become MICA’s curatorial studies program. It gave students the opportunity to (in our case) work with local museums designing every facet of an exhibition. Dan came on as a web designer and I dove head first into museum education. I spent three years in the program, the first two were with Dan working on an incredibly intense exhibition called At Freedom’s Door: Challenging Slavery in Maryland. Dan and I joke that if we had actually started dating while we were working on this project we never would have made it, the work was more than any of my other classes combined. Anyway, one day my sophomore year we had a presentation at Morgan University, an HBCU near Baltimore. I had brought my computer, my beautiful, giant MacBook Pro with all of my personal information (none of it backed up) so that Dan could use it to give a presentation (he had a desktop). I showed up and handed it over to be hooked up to the projector. All went perfectly, it was fine and dandy, until we forgot it. Somehow in the aftermath of class I thought Dan had it and he thought I had it and it got… forgotten. By the time I realized nobody had it I was out to dinner with some friends. I rushed back to Morgan, calling Dan frantically along the way, but it was gone. Someone had taken it and although Dan and I made a few trips back to Morgan to bug the head of security there was someone out there with all of my stuff. Which, it turns out, is very scary. 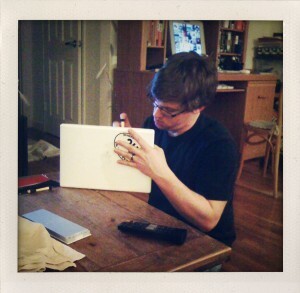 Anyway, shortly after I got my first credit card and purchased a MacBook, named it Ulysses and have had a close personal relationship ever since. He’s been doing well, plugging along for 5 years. Last year Dan replaced the harddrive and earlier this year he had to dive in and disconnect the broken optic drive, but the fact that this computer still runs is a near miracle. It’s been dropped, schlepped to class and on trips and back and forth to jobs. It’s been in the kitchen dangerously close to hot water and ingredients. It’s processed thousands upon thousands of photos and taken it like a champ. Until now. A few weeks ago it started randomly restarting, and then apparently my kernels panicked. Dan replaced something but it’s still acting funky so last night we bought a new iMac. It’ll be here next week and we’ve already decided to name it Admiral Adama. The point of me sharing all this is that right now my computer isn’t processing much when it happens to be awake. Which means that posting for the next week is going to be light at best. I wanted to apologize in advance and promise that I’d be back in action as soon as the Admiral was up and running. 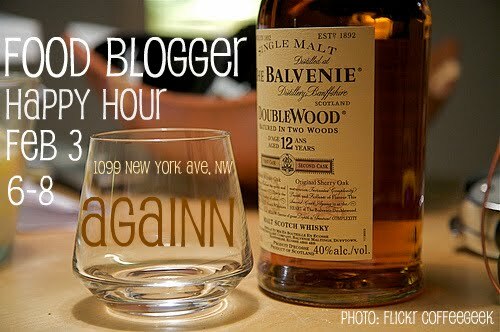 In the mean time, if you’re a D.C. area food blogger, you should stop by Aagain on February 3rd for a happy hour. After the potluck a few weeks ago I joined the planning committee, along with Arugula Files, Beer Spotter, Capital Cooking, Capital Spice, Common Man Eats, Dining in DC, Gradually Greener, Modern Domestic, Thrifty DC Cook, and We Love DC. RSVP here. sorry erin. when we have intern babies we’ll credit your genius.